It's not just a tag line, but what motivates us. Every item of furniture that enters the workshop is an opportunity for renewal. We are self proclaimed recyclers and love to bring new life to cherished sofas, chairs and everything in between. We are committed to consistent execution of your ideas and always deliver beautiful, long lasting results. Stop in today and experience the joy of re purposing. Our excellent workmanship and reasonable prices are guaranteed to satisfy. 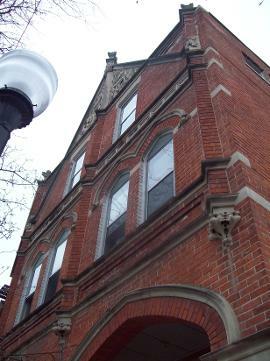 The Shultz building is listed on the National Register of Historic Places and boasts an eclectic history of ownership and various uses. Originally built to serve as Dr. Shultz residence and place of business for his medical practice, the first floor is cleverly divided to include both public and private spaces. Greek Revival architecture and a stunning three story staircase make 1421 Broadway a must see destination. A unique and ever changing mix of vintage furniture, collectibles and decorative treasures currently occupy the space.